2017 is coming to and end and so is my Scrappy Block Project 2017. My goal was to make at least 2 blocks a month for a year. I ended up with 30! Other than using scraps and left over components of quilt blocks, I really didn't initially have a plan for these 12 inch blocks. 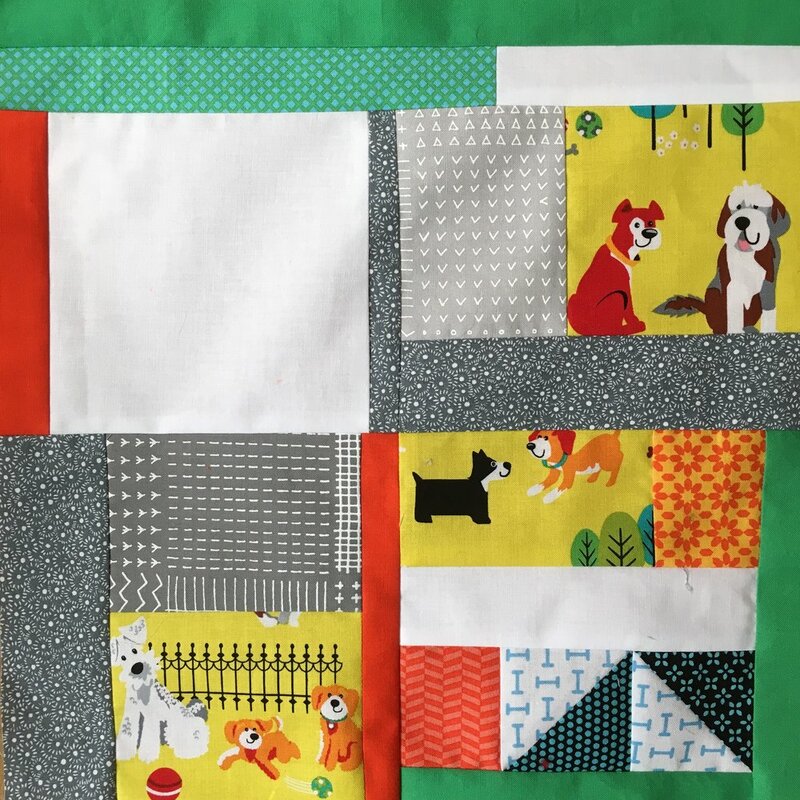 As time went on, I started putting an animal or other feature fabric somewhere in each block. Some months I also added plain white blocks which I really liked. I wish I had done that more consistently. 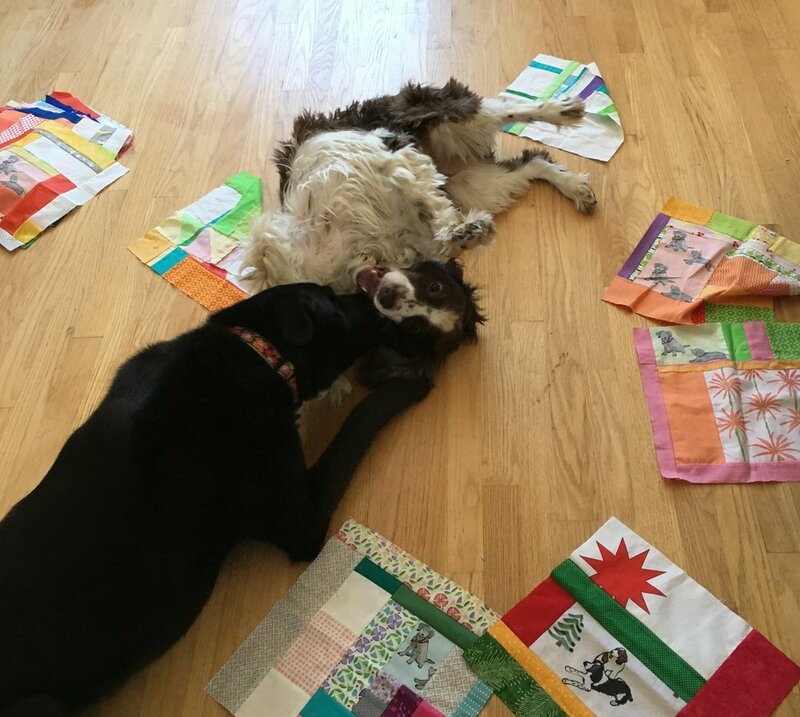 In this busy quilt, those white patches offer a resting place for the eyes. 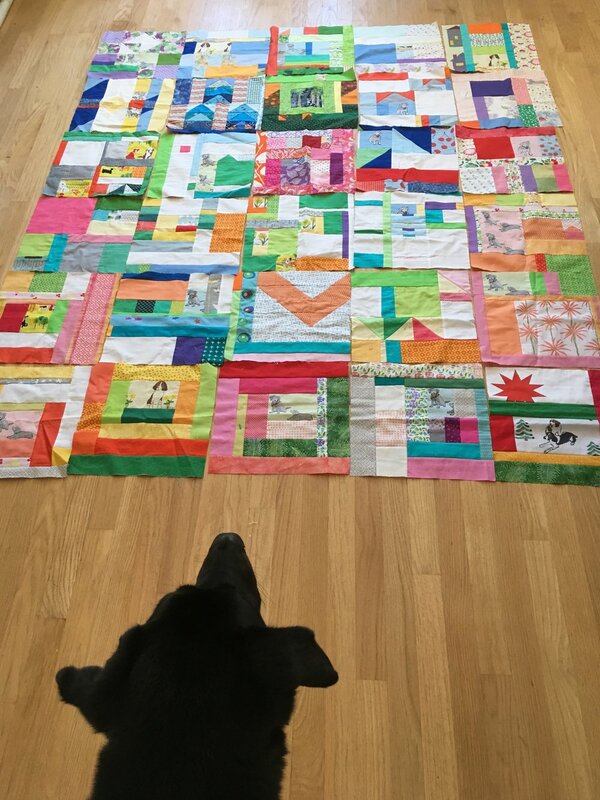 At 5 block wide and 6 blocks long, quilt will be long enough but I want it a bit wider. I found some orphan blocks from a project that just didn't work and there are enough blocks to add sashings between the vertical rows. The orphan are a bit bold, but I like them! I'll post a photo of the completed quilt sometime in 2018! So that wraps of this year long project. And what happens when a project is done? A party of course!! (Though I had to do some canine management to prevent the party from starting before I had all the photos I needed for this post)! Here are the two blocks I made in April for my Improv Scrappy Block Project. Now a quarter of the way through this project, it's clear that I'm headed in a modern direction, using quite a bit of Kona® white in the blocks. Looks like there are quite a few dogs, too! 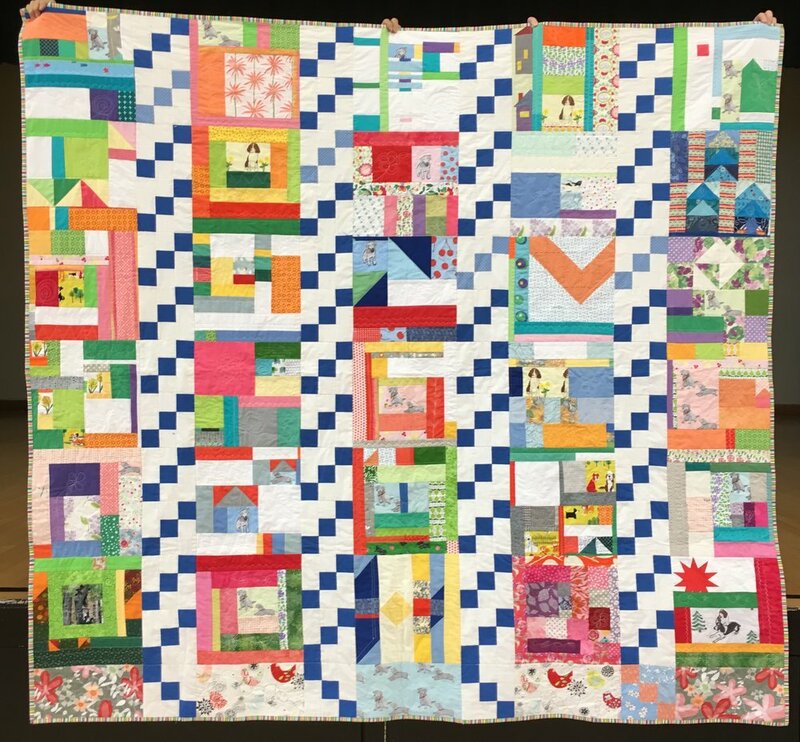 I didn't get any improv blocks sewn for my Improv Scrappy Block Project sewn in February. But I made 4 improv blocks in March, so I'm back on course with my 2017 project. (April blocks to follow in a later post)! Three of these blocks have scraps of fabrics I designed--the dogs and the concentric circles on the teal background-- which were digitally printed at Spoonflower.com. (These designs and others are available at my Spoonflower shop). These colors make me happy! They match the feel of March which is very early Spring/still really Winter in New England!